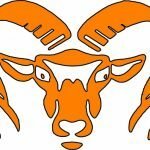 Having finished off the out of conference portion of their schedule with a 2-2 slate, the Rockford football team looks to defend their OK Red title from last season by journeying to East Kentwood on Friday, September 21st at 7:00 P.M. These two rivals have been squaring off since 1970 and both teams have dominated over different time frames in that span of 43 years. The Falcons won 14 of the first fifteen meetings between the schools. 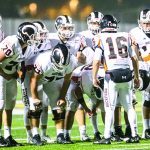 The middle years saw a slight East Kentwood edge and the Rams have won the last nine meetings. 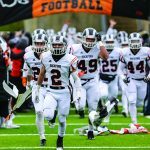 The all time record between the Rams and Falcons stands at 22 wins for Rockford and 22 wins for East Kentwood. 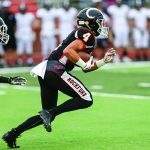 East Kentwood stands at 2-2 so far this season. The offense hasn’t been an issue in the two wins (40-30 over Grand Ledge and 49-14 over Muskegon Reeths-Puffer) but the defense has in the losses (23-12 to East Grand Rapids and 45-14 to Forest Hills Central). On the injury front, the Rams still have their share of concerns four games into the season. A quick glance on the sidelines showed at least seven Rams still not in uniform during Friday’s contest at Jenison. Starting quarterback Kyle Short was back in a walking boot after a brief appearance against Muskegon. Dalton Lyons was still out for the Jenison contest and Ethan Lussky has yet to see his first action of the year for a team that has been riddled with an epidemic of injuries all season long. But Munger is hopeful things are taking a turn for the better on that front for the Rams.